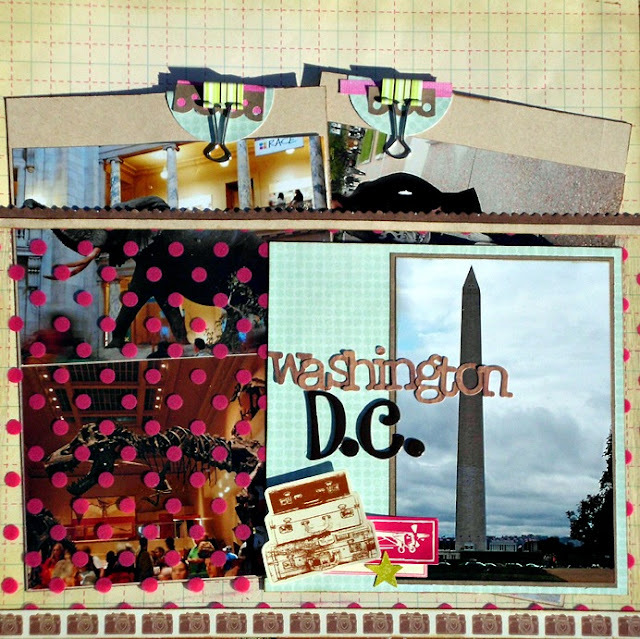 The layout above was completely inspired by one of Shimelle Laine's classes (4x6 photo love). 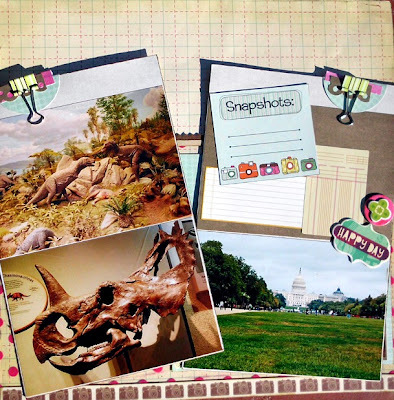 She is an absolute genius and one of my favorite scrapbookers so be sure to check her out. 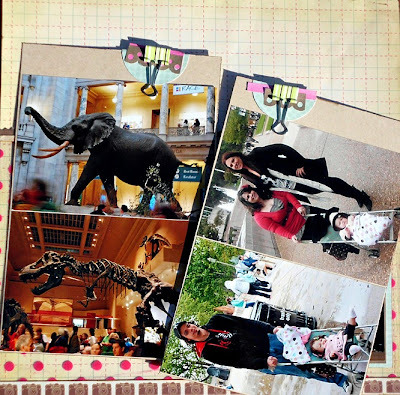 The photos are from the trip we took to Washington D.C. in 2011 when we get to go visit my best friend. The base of the layout is a paper from Cosmo Cricket's Upcycle line. The dotted transparency sheet (that makes the pocket portion of the layout) is the Beach Babe Flocked Transparency from Fancy Pant's Designs. The teal/blue portion that lays over the transparency is from My Mind's Eye's Good Day Sunshine collection. All the embellishments on the blue/teal portion are by Amy Tangerine (American Crafts). The wood grain alphas are from alphas from Crate Paper's Emma's Shoppe Collection and the other alphas are Thickers by American Crafts. The border strip along the bottom of the page is a strip cut out from one of Amy Tangerine's papers. The border at the top of the transparency/pocket is a border from Colorbök. The two pullouts that are inside the transparency pocket pop out to reveal more photos and a spot for journaling. 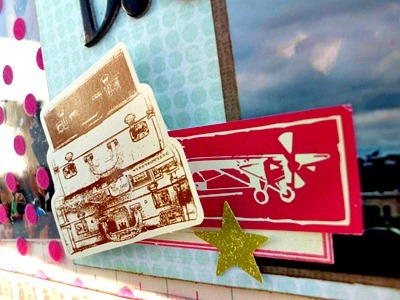 The journaling spots are by Amy Tangerine and Nikki Sivils and the embellishments are by Cosmo Cricket. The edges of everything were inked using Tim Holtz's Vintage Photo. 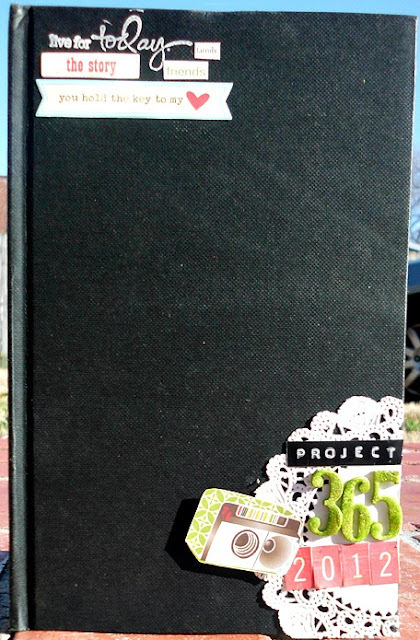 This next project is a journal that I altered for my project 365 photos. For now I've only spruced up the front cover but I will be treating this journal as a project 365 smash book - so I'll have more to share in the future. The journal is a simple canvas journal I bought from Wal-Mart. I love how it has the appearance of an actual book. I added a doily to the cover to back the title "Project 365 - 2012". This was my first time using my DYMO Label Maker and I love it! The 365 numbers are by EK Success. They were originally white but I sprayed them with Smooch Spritz - Citrus Tickle. The 2012 numbers are from a sticker sheet by Crate Paper's Emma's Shoppe Collection. I fussy cut the camera out of a paper from Jillibean Soup's Pasta Fagioli collection. In the upper corner I used a stamp from Michael's dollar bin to stamp "Live for Today". I added a variation of phrase stickers that I thought would relate to the pictures I have taken/plan to take for Project 365. They are from Jillibean Soup, Making Memories, and Crate Paper. EEEEEEPPPP!!!!! I love your book!!!!!! Hi Christina :) thanks for stopping by my blog and your kind comment. Your layout is super cool! 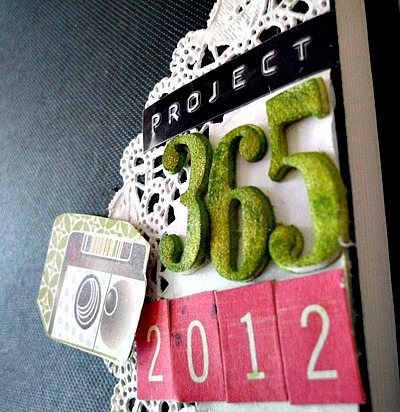 And the 365 cover is amazing.